My week in Spain was mostly spent in public high schools within Barcelona or in the surrounding suburban areas. I wanted to focus on high school students because they are at the exact stage in which the gender gap in mathematics performance begins to expand and possibly affect their future aspirations. Before I ran the experiments, I spent time meeting with teachers and school administrators to discuss the logistics and goals of my work. I was thrilled to find that everyone who I met with was very supportive of the fact that the gender gap is something that should be studied and addressed. This work could not have been completed without the cooperation and excitement of these folks, and I am extremely grateful to them. During the first part of my week, I visited Institut Severo Ochoa, which was one of the schools from which I collected data. 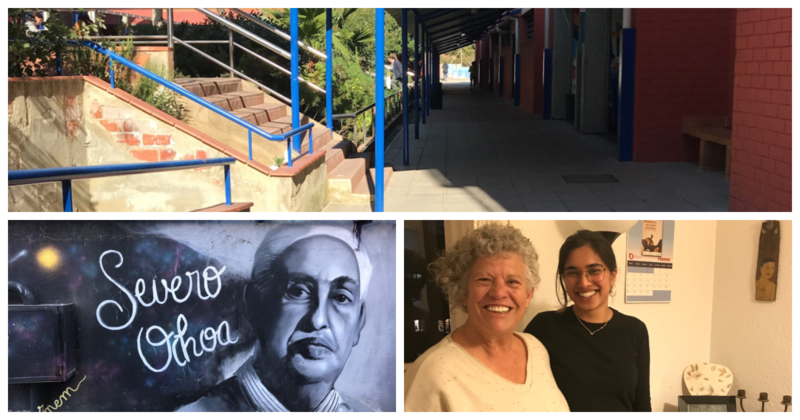 Walking onto Severo Ochoa’s campus was surreal; during my semester abroad, I had spent every Wednesday morning there volunteering, and the memories flooded back to me. I got to see and speak with many of the students who I had worked with the past year, and it was extremely gratifying to see how their English skills had developed. This visit to Severo Ochoa was mainly to drop off parental consent forms, which every student under the age of 18 had to get signed by their parents in order to be allowed to participate in the experiment. Along with Elena Ruperez, the English teacher who I worked with last spring, I visited several different classrooms and told the students a little bit about my project and gave out parental consent forms to those who were interested. After visiting Institut Severo Ochoa, Elena and I caught up over a coffee and her favorite Barcelona donut, Boldú! We both ordered donuts filled with “dulce de leche,” a deliciously sweet condensed milk, and sat down to chat. Being a teacher at a public high school, Elena is part of a system of teachers that is run by the Spanish government. When a teacher enters the system, they receive a number that functions as their lottery number. During a teacher’s first year, their number is usually very high. Teachers then get to request certain schools and/or regions in which they’d like to work, and they get placed depending on their number (the lower the number, the higher priority). Five years ago, Elena was placed at Severo Ochoa in Esplugues, which is technically within Barcelona but is certainly on the outskirts. Severo Ochoa’s students mostly come from low-income families and many do not matriculate to universities or vocational schools. Elena told me that although she could have moved on to a different school by now, she felt a sense of belonging at Severo Ochoa and decided to stay there. I too, after only a semester spent there, felt a similar sense of warmth toward the students and teachers at Severo Ochoa. The community is sincere; once the students get to know you, you’re one of them. Spain’s education system is slightly different from the United States’ system. Students attend secondary school until the age of 16 and then begin a two-year program called Spanish Baccalaureate, or “bachillerato.” The Spanish Baccalaureate is for students who plan on either attending a four-year university or a vocational school, and thus tends to be occupied by the high-achieving students in a school. I collected all of my data from students who were in “bachillerato,” but the levels of performance across the schools definitely differ, often reflecting the differences in economic resources. For example, the Institut at which I did my first round of data collection was IES Damià Campeny, an Institut in Mataró. Mataró is a fairly affluent beach town that is 30 minutes outside of Barcelona, by train. I was first put in touch with a school administrator at Damià Campeny through one of my friends from La Universitat de Barcelona who is originally from Mataró and went to Damià Campeny for high school. Comparatively, the students at this school come from wealthier families and the overall percentage of students who matriculate to four-year universities is higher than that of Severo Ochoa. The conversations that I had with teachers, administrators, and friends during the first part of my week in Spain were critical for building context and a deeper understanding of the populations from who I was collecting data. If I had not understood the system and its implications, I would have been completely blind to the intricacies of students’ situations at each school and how this might affect my work. I was glad to have so many people surrounding me who were willing and able to teach me and inform me in ways that only those with their experience could.